Meiyun Lin is a Research Scholar (with tenure) at NOAA and Princeton University’s Cooperative Institute for Climate Science. Lin’s research seeks to advance knowledge on the interactions of air quality with weather and climate to inform public policy. Specifically, she investigates how climate variability and change modulates heat waves, drought, intercontinental pollution transport, stratospheric ozone intrusions, and their impacts on surface ozone air quality. Meiyun Lin is also a Principal investigator for the IGAC/Chemistry-Climate Model Initiative and the NASA Aura Sciences Team in Atmospheric Composition. Lin earned her Ph.D. from the University of Tokyo (2007) and completed her postdoctoral work at the University of Wisconsin-Madison (2008-2010). We are hiring a post-doc. Please see here for details. (1)The tripling of Asian anthropogenic nitrogen oxide (NOx) emissions since 1990 outpaces the benefits of 50% US domestic emission controls, thereby raising surface ozone in Western US rural areas during spring. (2) In the eastern US, the ozone decreases driven by regional NOx controls were more pronounced in the Southeast, where the seasonal onset of hydrocarbon emissions from vegetation and NOx-sensitive ozone production occurs earlier than in the Northeast. (3) More frequent hot extremes and rising isoprene emissions from vegetation since 1990 would have worsened the highest ozone events in the eastern US during summer, if regional NOx emissions did not decline. 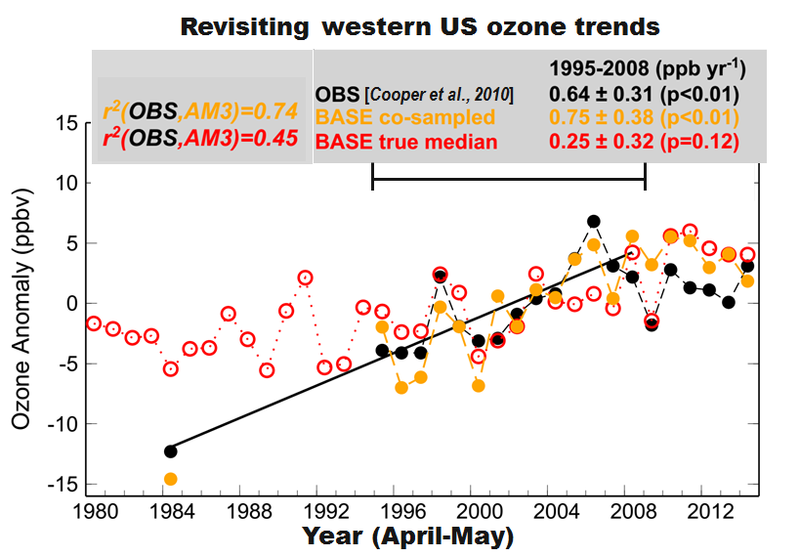 Is springtime ozone in the free troposphere over western North America in fact increasing over 1995-2008? Revisiting the analysis of Cooper et al. [Nature, 2010], we show that sampling biases can substantially influence calculated trends of ozone in the free troposphere over western North America. The model co-sampled in space and time with observations reproduces the observed ozone trend (0.65±0.32 ppb year-1) over 1995-2008 (in simulations either with or without time-varying emissions), whereas the ‘true average’ with continuous temporal and spatial sampling indicates an insignificant trend (0.25±0.32 ppb year-1). While rising Asian emissions in the past decades raise ozone background over North America, attribution of observed trends requires consideration of internal climate variability, particularly for short record length. Exposure to ozone is harmful to human and plant health. There is mounting evidence that intrusions of stratospheric ozone deep into the troposphere can elevate western US surface ozone to unhealthy levels during late spring. This study reveals a connection between these intrusion events in US West and La Niña, an ocean-atmosphere phenomena that affects global weather patterns. Recognizing this link offers an opportunity to forecast ozone several months in advance, which would help western US air quality managers prepare to track these events for public health alert. Identifying these events also have implications for attaining the US national ozone standard. Tropospheric ozone is a greenhouse gas, biological irritant, and significant source of highly reactive hydroxyl radicals. The response of tropospheric ozone to changing atmospheric circulation is poorly understood. This paper shows that over the past four decades, shifts in atmospheric circulation have played a key role in the autumnal ozone increase and the absence of spring ozone change over Hawaii by modulating pollution transport from Asia. 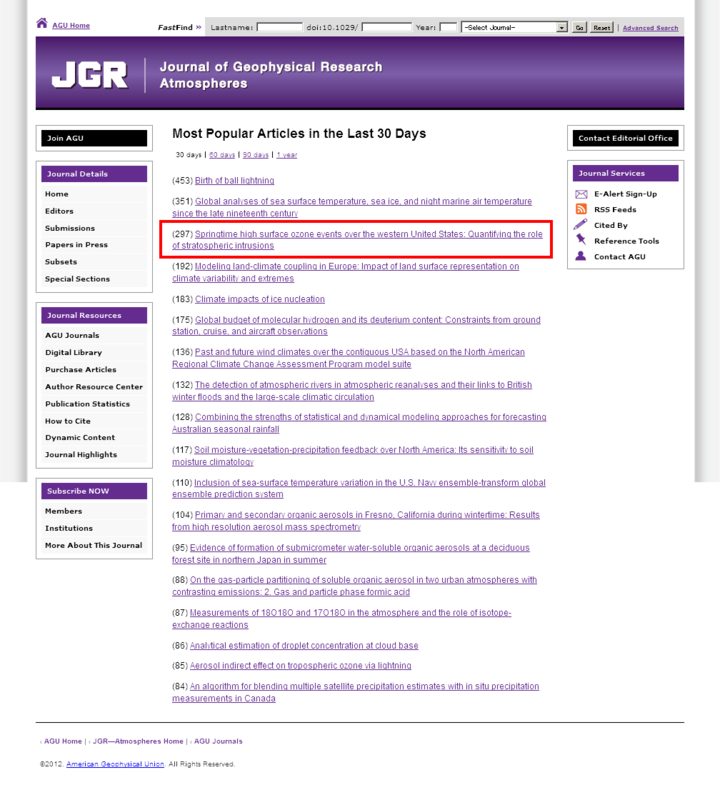 This finding implies a need to consider decade-long variability in climate when detecting and attributing trends in tropospheric ozone levels to changes in human-induced emissions. Springtime high-ozone events in Western U.S. surface air: Role of stratospheric intrusions. 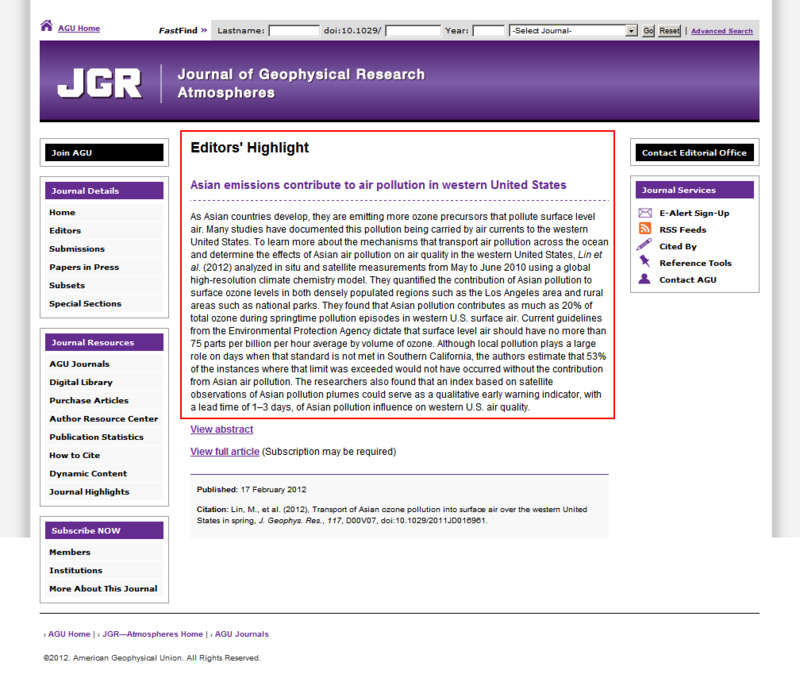 >Article by Meiyun Lin et al. in J. Geophys. Res.